Private collection, Japan, acquired prior to 1980s. Anonymous sale; Christies, New York, 12 December 2002, lot 16. Private collection, New York, acquired at the above sale. with Charles Ede Ltd, London, from whom acquired by the present owner in 2006. 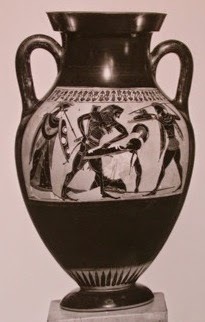 Were the staff at Christie's in New York unaware that the amphora had resided in a Japanese collection in the 1980s? Why were they unable to provide that information? This amphora is important as Dr Christos Tsirogiannis has spotted the piece in the Becchina archive. Indeed the annotations on the record card show that images of the amphora were sent to three European academics. Becchina had links with a Japanese dealer so the private collection in Japan is not without interest. And (part of) the stock of Becchina's Basel operation has been the subject of considerable interest since it was revealed earlier in 2015. Will 'the gentleman' withdraw the amphora from the auction? Or will Christie's withdraw the lot? And what does it say about the 'due diligence' search conducted by Christie's prior to the sale? I'll point out again - the auction houses seem not to have access to the archives that Dr Tsirogiannis has been using. Do you feel that their due diligence would have been more rigorous if they had the same level of access as he does?